The design of the SM931C is basic but attractive. The bezel is finished in a reflective glossy piano black colour, with a small section of silver at the bottom just above the OSD operation buttons. The power button has a brushed aluminium finish and a subtle blue LED glow behind it. This looks very nice and adds to the sophisticated feel of the design. The materials are all of decent quality and the screen feels sturdy and well built. The screen only offers basic functionality unfortunately, with a simple tilt stand affording about 20° movement backwards from a vertical position. It's a shame not to see height adjustment on this screen, and a 19" diagonal is also a suitable size to offer rotation adjustment for those who might find it useful. Neither is present here. The back of the screen offers VGA and DVI interfaces which can be hidden by a detachable plastic section. The power cord is also hidden by this, and since the screen features an integrated power supply, there is no need for any external power bricks here. Strangely (for a modern screen) the SM931C doesn't offer any form of cable tie at the back, but at least they are reasonably easy to hide behind the stand. The OSD is easily navigated and the operational buttons are easy to feel on the underside of the bezel. There are options available as expected for brightness, contrast, colour levels, and gamma mode (1,2 and 3). There is single button control for 'MagicBright' options as well as for brightness, source and auto configuration (analogue interface). The Samsung SM931C utilises a 6-bit TN Film panel with Frame Rate Control technology, capable of producing a 16.2 million colour palette. The Wide-CCFL backlighting used offers a gamut covering 97% of the NTSC colour space. An important thing to consider for most users is how a screen will perform out of the box and with some basic manual adjustments. Since most users won't have access to hardware colorimeter tools, it is important to understand how the screen is going to perform in terms of colour accuracy for the average user. I restored my graphics card to default settings and set it to its standard profile. The SM931C was tested at default factory settings out of the box using the LaCie Blue Eye Pro and their accompanying software suite. Default settings of the screen were 100 brightness, 75 contrast. Gamma Mode was set to '1', Color Innovation and MagicBright profiles were set at 'custom', and RGB levels were all at the default level of 50. At default settings the most obvious issue with the SM931C was that the screen was far too bright. This isn't uncommon for LCD's displays at factory settings, and a simple adjustment of the brightness setting from 100 to about 35 made the screen much more comfortable. For the purpose of this analysis I have left all settings at default for now. The screen had a noticeable tendency towards blue in normal use, and while colours looked vivid, they were perhaps a little too cartoony and washed out for my liking. Testing the screen with the LaCie colorimeter revealed some frankly quite poor performance at factory defaults. While colour temperature was actually pretty good at 6407k (only 1% deviation from the desired 6500k suitable for LCD's in normal lighting conditions), gamma was a little out at 2.0, and luminance was clearly too high at 190 cd/m2, only a little lower than the specified maximum brightness of 250 cd/m2. I tested the screen again using the other gamma preset modes (2 and 3), but these actually moved me further away from the desired 2.2 gamma recommended for LCD displays, to a measurement of 1.7 and 1.8 respectively. The preset mode 1 for gamma is the closest to the desired level here. Colour accuracy out of the box was poor, with an average DeltaE reading of 9.4, and a maximum of 17.5! Clearly the colour rendering capabilities of this screen were not great at default, and would need some adjustment and calibration before you even thought about doing any colour critical work. It's not uncommon for displays to have very poor colour accuracy at factory settings, but it is a shame that the SM931C was so poor, especially given Samsung are targetting this screen at those users looking for a screen with excellent colours (as evident by their W-CCFL 97% NTSC gamut). Other screens I have tested, such as the Acer AL2216W for instance, are actually pretty good at default settings, even for TN Film based budget screens. Clearly here the panel was not given much calibration in the factory before it was packaged and sent out for retail. With luminance recorded at 190 cd/m2, black depth was measured at a decent 0.28 cd/m2. This was a good show at least for the SM931C, and a promising result for a TN Film panel. This left us with a useable contrast ratio of 679:1, not far off the specified 700:1. 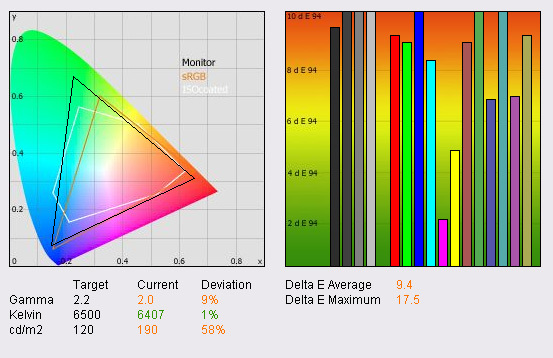 On to the most interesting aspect of the SM931C, the colour gamut. 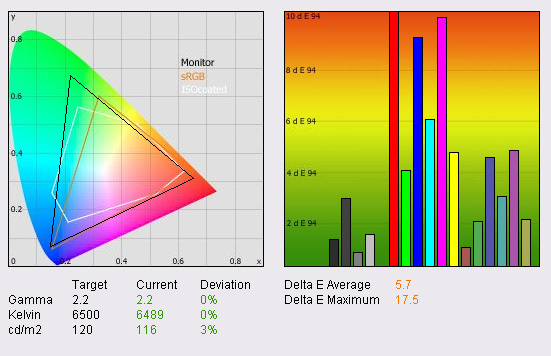 The CIE diagram on the left hand side shows that the monitor's colour gamut exceeds the sRGB colour space quite significantly. Usually, standard CCFL backlighting means that the monitor's gamut only ever covers this sRGB space, without extending outside it. However, thanks to the wide CCFL backlighting here, the gamut covers much more space in the diagram, and the triangle stretches more towards the green hues offering a noticeable improvement and offering purer and deeper shades. The analysis with the colorimeter confirms that the screen does indeed offer a colour gamut outside that of a normal 72% NTSC coverage screen. Calibrating the screen with the LaCie Blue Eye Pro was successful to a point. Gamma was nicely corrected to the desired 2.2, colour temperature was adjusted to 6489k (pretty much spot on the 6500k desired), and luminance was now at a much more comfortable 116 cd/m2. During calibration the screen's OSD settings were adjusted to a brightness of 35, and RGB levels were changed to 40 / 32 / 20 respectively. The screen felt much more comfortable in practice, and colours looked more even and less washed out than I had experienced at default settings. The screen still showed a noticeable change in green shades as compared with normal backlit screens I am used to, but while they did feel pure and deep, I wasn't sure if I preferred them or not. It takes a little getting used to I think, as they almost look a little overly vivid at first, but there's no denying that the screen is capable of showing a wider range of colours than other models the market is used to. Colour accuracy was improved a bit, but still remained disappointing. Grey shades were significantly improved, to the point that all were DeltaE <3. However, colours were on the whole still quite poorly rendered, with an average DeltaE overall of 5.7 and a maximum of 17.5 still. Even with professional calibration, it seems the 931C is sadly not able to offer truly accurate colour reproduction, despite the way it is marketed at colour enthusiasts. It may also seem a bit of an odd choice to feature an enhanced colour gamut on a screen which is based still on TN Film technology. Given the variation in contrast and colours detectable with even a slight change in viewing angle (inherant to TN Film), and the fact that the panel is using frame rate control to boost it's 6-bit colour depth to 16.2 million colours (not a true 8-bit colour depth), it seems a strange choice to almost go half way with the effort to produce a screen for colour enthusiasts. I would have personally preferred to see a panel capable of more accurate colours than having the enhanced colour gamut which almost feels a bit gimmicky in this instance. Testing the screen with colour gradients showed some slight gradation in darker tones, but no sign of any real problematic banding. If you look closely you can detect some slight twinkling from the FRC techniques used, but nothing which I would say was distracting or obvious in normal use. With luminance now recorded at 116 cd/m2, black depth was improved further to 0.21 cd/m2, giving a useable contrast ratio of 552:1. The black depth of this panel is at least very good, and even beats the S-MVA based Viewsonic VX2435WM tested recently (0.22 cd/m2). It still remains a step behind what is possible from some VA based matrices, such as the PVA panel in the Samsung 971P (0.1 cd/m2), but still a good showing for the SM931C here. I tested the screen with the dynamic contrast option enabled, to establish what the best black depth and luminance values that were attainable using this feature, and therefore what the best dynamic contrast ratio was. The results are shown above. Maximum luminance was recorded at 213 cd/m2, a little way off the supposed 250 cd/m2 the screen can offer. Best black depth was recorded at 0.18 cd/m2, but this gave us a dynamic contrast ratio of "only" 1183:1. This was quite a way off the maximum 2000:1 specified, but then even if luminance was recorded at the 250 cd/m2 Samsung claim the screen is capable, you'd need a black depth as low as 0.125 cd/m2 to produce a 2000:1 DCR which I don't think this panel is capable of. Viewing angles of the SM931C were as expected really for a TN Film panel. Horizontally there was an obvious change in contrast and colour even from about 10 - 15° from a perpendicular field of view. There was a pinkish tint to the screen as you moved your head sideways. From above, the panel's viewing angles were not too bad, but from below there was the obvious contrast shift and severe darkening which characterises TN Film technology. Nothing unexpected here really. Settings the screen to an all black background and observing it in a darkly lit room allowed me to examine the uniformity of the backlight. It's not uncommon for LCD displays to show some degree of leakage around the edges of the screen, and the SM931C was no exception. The leakage was quite slight, but you could detect some slight variation in uniformity particularly at the top and bottom of the screen. This wasn't too bad, and certainly nothing to be overly concerned with, but the uniformity was not perfect here. I've always been a fan of widesceen monitors for office use, as the ability to do side by side working is a real bonus in my opinion. You really need a horizontal resolution of at least 1680 (20"WS and above) I feel to make the most of this, with larger screen sizes really offering some excellent split screen working to give you that dual-screen feel. The SM931C is of course only a regular 5:4 aspect monitor with a resolution of 1280 x 1024 so it isn't ideal for this type of use. However, I can't really hold that against this screen since clearly if you buy this model, you know what to expect here! Default settings for brightness are way too high for any comfortable office use, and the white backgrounds of word documents can really strain your eyes. The MagicBright preset mode for 'text' adjusts the brightness down to '19' which is much more comfortable, but a setting of around 30 - 35 was comfortable in my lighting conditions and met the 120 cd/m2 luminance value attained during calibration. Testing the screen on both analogue and digital connections showed that there was a fairly noticeable improvement in text clarity and sharpness when using the DVI interface. While the 'auto' optimisation helped get a reasonably comfortable setting for the VGA interface, it did not offer the picture quality that is capable from DVI. I would certainly recommend using this screen with DVI wherever possible. The pixel pitch of a 19" display is 0.294mm, and so text is noticeable larger than on a 17" (0.264mm) or 20"WS (0.258mm) screen. This isn't necessarily a bad thing, as it can mean the screen remains a little more comfortable over long periods of use, but it does lack a little of the sharpness that you can see from a tighter pixel pitch. Viewing angles were perfectly adequate for office use, and there was not really any issues elsewhere either. No problems using this screen for office applications in my opinion. The SM931C has an interesting feature when it comes to analysing it's performance in moving images and testing the panels responsiveness - it features an option to turn RTA (Response Time Acceleration) on and off. This feature is accessible through the OSD and can be simply switched on the fly allowing you to compare, pretty easily, the screens performance with and without. This RTA function is Samsung's own overdrive technology, designed to boost grey to grey response times and improve panel responsiveness in practice. Above: RTA on and off options through OSD. 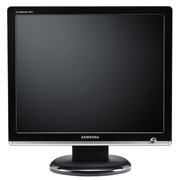 The Samsung SM931C was tested using the chase test in PixPerAn, a good bit of software for trying to quantify differences in real terms responsiveness between monitors. As a reminder, a series of pictures are taken on the highest shutter speed and compared. The images above show the best case example on the left hand side, and the worst case example on the right hand side. This should only be used as a rough guide to comparative responsiveness but is handy as a way of keeping a constant test of each screen. I tested the screen with the RTA function turned on and off. I could even leave PixPerAn running and switch between both states on the fly which gave me a very easy way to compare responsiveness with and without this technology. As you can see from the above images, with RTA on, the Samsung SM931C was noticeably faster than without. This is pretty much expected, but sometimes these functions to turn overdrive on / off don't work properly. In this case, turning the feature on improved actual responsivenss significantly. You could immediately notice that the blurring was reduced and you could no longer clearly see a trailing ghost image behind the moving car. Clearly the RTA function serves a good purpose here, and boosts the response time of the panel across grey transitions. I'd recommend leaving this option enabled for gaming certainly. Comparing the SM931C with two of the faster models I have tested in recent months, we can see that the screen does perform quite admirably. Above are the images for the NEC LCD20WGX2 (6ms G2G rated AS-IPS panel) and the LG L1960TQ (4ms G2G rated TN Film panel). In practice, with RTA turned on, the SM931C performs quite comparably to the LG L1960TQ. This is no surprise since both are based on TN Film matrices, and both use a hefty dose of overdrive to boost their grey transitions. In practice, there is no noticeable difference between a 4ms G2G and a 2ms G2G rated panel. Gaming showed some good performance with no obvious ghosting, just the usual texture blur evident if you know what to look for. This is always an issue for LCD type displays without additional technologies to reduce the perception of blur (MPA, BFI etc) but I doubt many users would find problems with the SM931C's gaming performance really. The MagicBright preset for 'game' boosted brightness a lot, which can be handy in some darker games. As usual I tested the screen in clone mode with a CRT to determine the level of input lag. This is something which can put off some gamers and is a delay between graphics card and monitor output. By hooking up a CRT you can show that the LCD lags behind somewhat, which can affect users in some situations where they rely on the screen image being as fast as their inputs (e.g. fast FPS shooting games). Often, input lag is very low and probably wouldn't represent too much of a problem in real terms. The SM931C showed typically an input lag of around 10ms, with some instances where this reached as high as 20ms. Nothing major to worry about in most cases, and a notch faster than some other screens tested such as the Viewsonic VX2435WM (30 - 40ms typically). Being a 5:4 format screen, the SM931C isn't ideal for video applications. Widescreen monitors are so plentiful in today's market, I'd really question why anyone would buy a 5:4 aspect screen if they intend to watch many movies on their display. The restrictive viewing angles don't lend themselves well to movie viewing either, but it's possible to position the screen to face you if you're on your own for some occasional use. The limited ergonomic adjustments come into play a bit here, and it's a shame there's no pivot or height adjustment which can often help re-position your screen to a more comfortable angle, especially when watching from a nearby sofa or bed. Black depth is decent at least for darker scenes, and while the colours are not particularly accurate, they are nice and bright and vivid, which is often favourable for viewing videos anyway. The 'movie' preset mode in the MagicBright menu was brighter than my calibrated standard profile, but might be of use to some people at least. The digital interface on the SM931C is not HDCP certified sadly, which may go against it with future encrypted content. Sometimes aggressive overdrive application can accentuate noise in movie sources and lead to additional unwanted 'twinkling' artefacts. I tested the screen and switched between RTA = on/off but saw no obvious issues with the RTA function being left on. It seems the overdrive control was pretty good on this model from what you can tell in practice. Again, motion blur was reduced a little (less noticeable in movies, but still an improvement), and I don't see any real reason to turn this off to be honest. If you do notice noise in video playback, that option is always there, and may help reduce it a little if you turn RTA off. All in all, noise was not too bad considering the use of a TN Film panel, and certainly no issue from a metre or so away. The Dynamic Contrast feature can be quite handy in videos, helping to alter the backlight on the fly, improving blacks in darker scenes, and making light scenes brighter. Quite a handy feature for movies, and probably the best use of this feature really. I have mixed feelings about the SM931C really. On one hand, you've got a bit of a mixture of high end specs and technology (2000:1 dynamic contrast, 2ms G2G overdrive, W-CCFL backlighting); and on the other you have what feels like corner-cutting sacrifices in an effort to keep the cost down and presumably to keep the screen competitive in the market place (use of TN Film, minimal ergonomics, limited colour accuracy). The 97% NTSC colour gamut did offer some noticeable differences in practice to colour depth and vividness, and green shades in particular were improved. It's an odd choice to couple this with TN Film, but if you want the latest technology, it is there I suppose without breaking the bank. I would have liked to have seen this backlighting combined with a more premium S-PVA panel from Samsung perhaps, but maybe this will be saved for the larger models. It is a bit of a shame that colour accuracy was sacrificed to bring you a wider gamut, which almost begs the question as to why they bothered. Seeing as most people won't have access to colorimeters, it probably doesn't matter too much anyway, as they will enjoy the vivid colours and deep shades, something which the SM931C does well. Responsiveness is very good, and even if it has no other real purpose, the availability of an RTA option is nice so you can see the affect for yourself of their overdrive circuitry. I think I'd position this screen as an attractively designed model with some nice specs, suitable for casual users and gamers who might like the enhanced colour gamut, or just want the latest and greatest spec and technology.